Willie Bain: "This is a resounding victory for Gordon Brown and for Labour"
Labour has claimed a "resounding victory" after comfortably winning the Glasgow North East by-election and seeing off an SNP challenge. The contest was sparked by Michael Martin's resignation as Commons Speaker in the wake of the MP expenses scandal. Willie Bain won with 12,231 votes - a majority of 8,111 - while the SNP came second with 4,120 votes. The Tories came third with 1,075 votes, and the BNP was fourth with 1,013 votes. The Lib Dems came sixth. Voter turnout, at 32.97%, was a record low for a Scottish by-election and 12.8% down on the 2005 General Election. Speaking from the count at Glasgow's Scottish Exhibition and Conference Centre, Mr Bain described the result as, "a great day for Labour", adding: "This is a resounding victory for Gordon Brown and Labour. "This by-election has been about many things, but, most of all, it has been about jobs and the economy. "People have had their say. They have backed Gordon Brown in his efforts to secure our economic recovery, they have sent a resounding 'No' to Alex Salmond and his treatment of our great city and a resounding 'No' to David Cameron." The constituency, where Labour has been the main political force for the last 74 years, neighbours the Glasgow East seat - which the SNP snatched from Labour last year in a stunning by-election victory. But the SNP conceded shortly after the polls closed it had not managed to repeat the result. The party's candidate, David Kerr, told supporters: "Our message through the campaign was simple. "For all the problems this constituency and this country face, our potential is far greater still. "But it is a potential that will only be achieved through freedom." SNP leader and Scottish First Minister Alex Salmond expressed disappointment, but said the party had achieved its best share of the vote in the constituency for 35 years. Conservative candidate Ruth Davidson said the party had run an "energetic and positive" campaign, while pointing out the Tories had not contested the seat since it had been held by the Speaker of the House of Commons. She told the BBC: "If you look at our recent European election results, we more than doubled the vote and we increased the share, so I think you can say this was absolutely a building process for us - we were starting from zero and we've come all the way up to third, so I don't think we should be too disheartened." And so, as billed, a clear victory for Labour. But bigger than expected, with the Labour vote increasing by more than the SNP. The BNP came in fourth place - not the anticipated third. That honour went to Ruth Davidson of the Tories, who is generally thought to have fought a successful campaign. Liberal Democrat candidate Eileen Baxendale, who received 474 votes, was beaten by the left-wing party Solidarity and its candidate, former MSP Tommy Sheridan, who came fifth, after winning 794 votes. Ms Baxendale said: "I congratulate Willie Bain, but look forward to holding him to account at the General Election on all the promises he has made." Green candidate David Doherty secured 332 votes to come in seventh, followed Glasgow Airport attack hero John Smeaton, who got 258 votes. 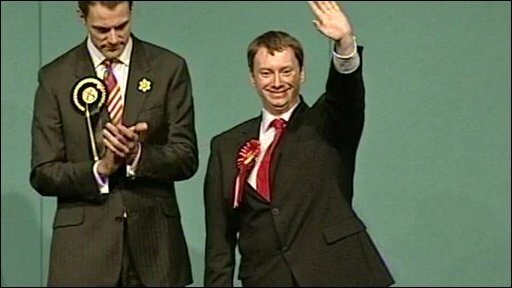 The Scottish Socialist Party's Kevin McVey was ninth, with 152 votes, followed by former Big Brother contestant Mikey Hughes, with 54 votes. Louise McDaid, of the Socialist Labour Party, received 47 votes and was followed, in twelfth place, by independent candidate Mev Brown. Colin Campbell, of the Individuals Labour and Tory, came last with 13 votes. Mr Martin - now Lord Martin - held Glasgow North East in the 2005 General Election with a 10,134 vote majority. It has emerged that police are investigating two alleged incidents of voting fraud in the contest. Council chiefs said the investigation involved three ballot papers - two cast at a ballot box at one polling station in the Dennistoun area and another cast at another polling station in the same area. A council spokesman said: "We had two incidents at polling stations where voters turned up and when they identified themselves they were told their names had already been scored off the list - somebody had been given a vote in their name." He continued: "We checked our processes to ensure it wasn't a mistake, it wasn't as far as we can see, so we called in the police." He said officers were investigating "alleged personation". Where is Glasgow North East?